Braxton has Rubinstein-Taybi Syndrome (RTS). RTS is a rare condition that affects multiple systems and has distinct facial characteristics. Individuals have mild to moderate intellectual disabilities. For Braxton, RTS affects his brain, heart, hearing, digestive system, and overall development. He just turned 4 years old and is developmentally closer to about 15-18 months old. Like many individuals with Rubinstein-Taybi Syndrome, Braxton does not have verbal speech. We did not know about Braxton’s RTS diagnosis until he was 2 years old, but even before that, we knew he would have trouble with communication. He passed a newborn hearing screen, but at 9 months old we saw an Ear, Nose and Throat (ENT) specialist due to persistent ear infections. At that time, Braxton failed a booth hearing test so the doctor recommended a sedated hearing test. Just before Braxton was a year old we learned about the hearing loss and by 15 months old, he was fitted with hearing aids. He was diagnosed with mild to moderate mixed bilateral hearing loss. 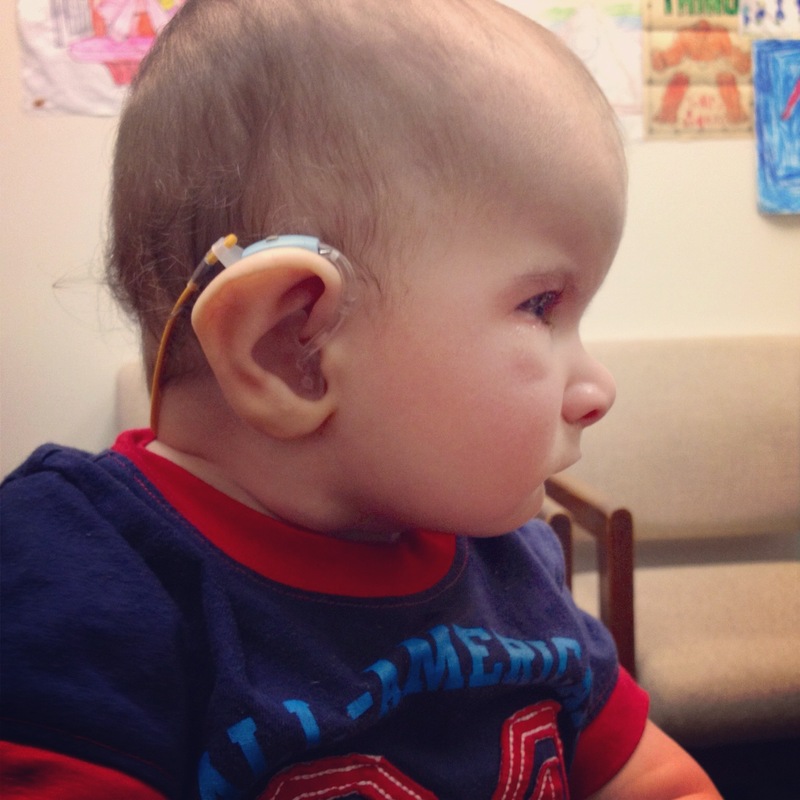 We hoped the hearing aids would bring his hearing to within normal range and help with speech development. Communication is one of the very basic human needs and we very quickly realized that we would now have to find other ways to communicate with our son due to the hearing loss. That is exactly what Augmentative and Alternative Communication (AAC) is: any form of communication other than oral speech used to express various thoughts, wants, needs, and ideas. There are low tech forms of AAC (i.e., Picture cards, sign language) and high tech forms of AAC (i.e., dedicated speech devices, iPads using communication programs, eye gaze systems, etc). This is our journey from low tech to high tech. Our journey, is just one of many. There is no one-size-fits-all system of communication for any child. I share our story just to offer another perspective of a family desperately trying to help their child find a voice to communicate their basic wants and needs. And also to share tips, resources, and things I wish I had known earlier. We were very fortunate to have our local Early Childhood Intervention (ECI) state service plugged in early on. Once we learned about the hearing loss, our ECI coordinator helped us get in touch with our local school district to provide services. A teacher for the Auditorily Impaired (AI) came to our house once a week to help us learn basic sign language and how to adjust to having a hearing impaired child. Our AI teacher let us know about sign language classes being provided by our school district. The classes were for parents and professionals. We signed up right away with high hopes. We began learning Signed Exact English (SEE) with other parents and school teachers. I have to digress here to say just how awesome it was to see the teachers in this class who attended (without extra pay) to learn how to better communicate with their students. They were enthusiastic and very interested in learning and preparing their lesson plans. I was thrilled to see that these were the type of educators who would be working with my son when he went to school. I know this is not the case in a lot of districts, but I want parents to know these teachers ARE out there. But, that’s a story for another time. We were fervent in our attempts to learn different signs and practiced regularly. Even big sister joined us in our learning and caught on quickly! To our dismay, Braxton blankly stared at us as we talked and signed to him. When introducing any form of communication, best practice says to start with things that are highly motivating (favorite toys, food, people, activities) – we tried, but there was no response. We didn’t give up right away, but OUR motivation to learn fizzled out when we realized Braxton had no interest. We continued learning and still sign today and Braxton is exposed to sign language at school as well. Here is Aileen showing the signs she learned to introduce herself and her brother. About 4 months ago (about 3 years after we first signed up for the SEE class), Braxton started signing “all done.” He very purposefully told us when he was done with an activity. Not too long after that, he began signing “more.” My interest in learning and teaching him sign language has sparked once again and we will keep trying to increase the ways he can communicate. There is an entire system based on the use of picture cards called the Picture Exchange Communication System (PECS), but what we used was a rough version of that system. 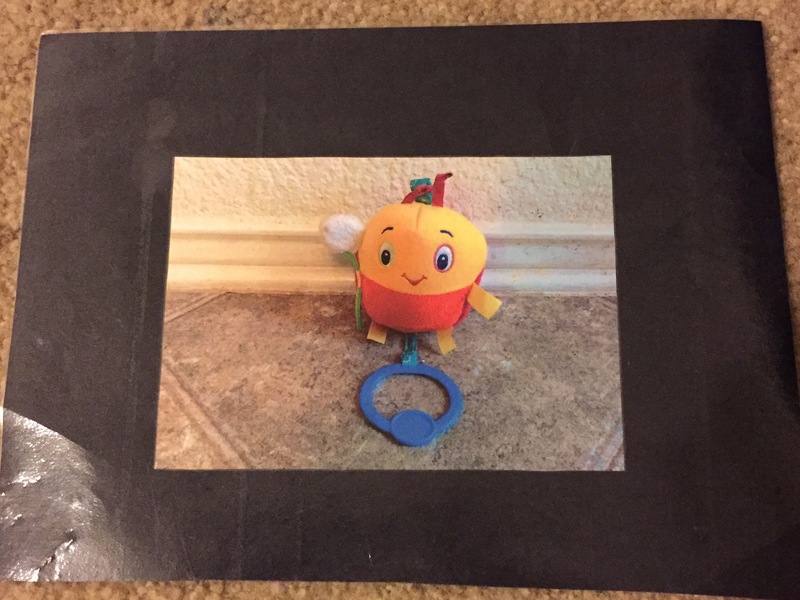 Our AI teacher helped us create photos of some of Braxton’s favorite items. One of our initial goals with the picture cards was to help Braxton understand that the picture represented the real thing. We would show him the picture and item side-by-side. We then showed him how to touch the picture. When he touched the picture, we immediately presented the item so he could learn that if he wanted to “select” the item he had to touch the picture. We moved on gradually to presenting him with two pictures and having him select the one he wanted. We took pictures of various toys, people (mom, dad, sister, therapists), and activities (food, bath, sleeping). Here is a picture of a stuffed toy Braxton was very fond of when we introduced this system. It took some time, but Braxton did eventually learn that the pictures helped him get what he wanted. He began to select his preferred choice more and more often which helped us move to a beginning “high tech” solution. We also introduced a picture schedule in this manner. We selected 4 key activities in his day to be represented. We had a folder which held the various parts and on the outside was a velcro strip. We took out the current activity and stuck it to the front of the folder. We worked on having Braxton select the activity so he could learn his daily schedule, this would be important for him when he finally entered school. We used a photo of him eating to indicate meal time, a photo of him in his car seat to indicate that it was time to go somewhere, a photo of him bathing to indicate bath time, and a photo of him sleeping to indicate bedtime. He was not too interested, but we did use the schedule for quite a while. One of the first communication apps we used was called Sounding Board. Sounding Board is a FREE app that allows you to create your own communication boards with up to 20 options. It also comes with pre-loaded boards that can be used as well. We used Sounding Board in a very similar manner to the picture cards. We started using the app when Braxton was around 18 months old. 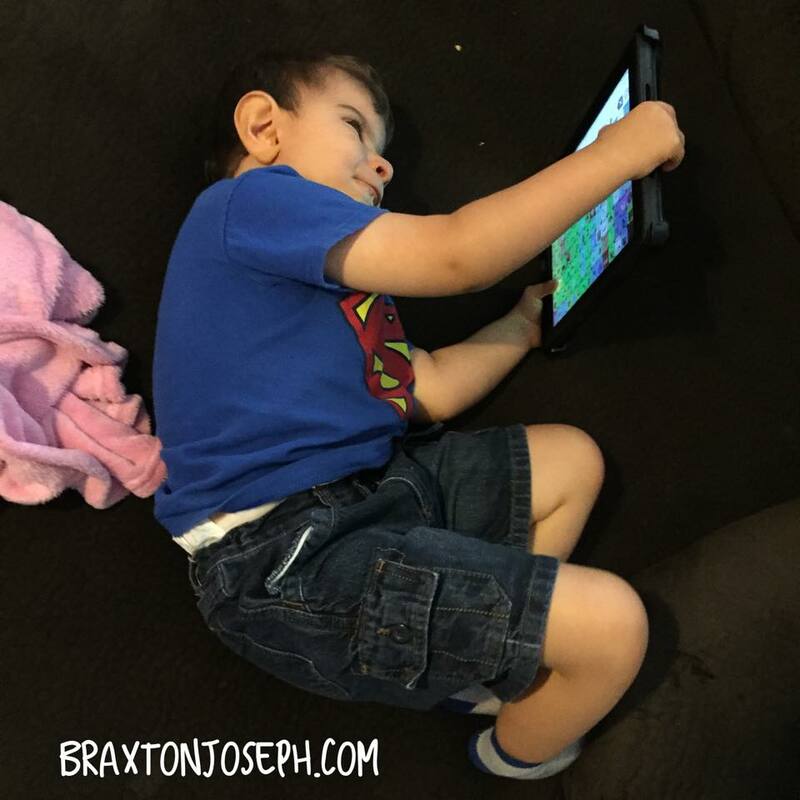 We started with two options when we introduced the app to Braxton. One choice was a toy that he really liked, and the other was one he didn’t really care for. We presented the app to him and sure enough, he reached out for the item he really liked. We immediately responded by given him the item he had selected. The key here was that immediate response so he began to associate the selection with getting what he requested. When he seemed to get that down, we changed to two items that he really liked. We also gradually increased his wait time so that he learned he might not always get what he wanted immediately. I personally liked that the app allowed us to use real pictures instead of just symbols. We did gradually move to symbols to help him prepare for a communication system. For example, we took a picture of a car he really liked and later we were able to replace that real car with a generic symbol of a car and Braxton understood that it still meant the car he wanted to play with. Overall, Sounding Board was a great stepping stone introduction into the high tech AAC world for us. We still use it today when we want to make a quick board for our environment (playground, favorite apps, current activities) – it can be used on an iPhone so it is very convenient when needed quickly. I personally feel that It isn’t really ideal for a complete communication system because you would have to create your own boards for every situation and then scroll through all of the boards when trying to say something. This is the main menu of the app. You can see the user created boards and the preloaded boards. Here is a user board we created with four different songs Braxton likes. He was able to select the one he wanted to hear. A sample board for various activities having to deal with entertainment. Here is a sample board for different expressions. This is a preloaded board with Emergency Info. You can program it to say your information. After using Sounding Board for a while and doing further research, I really felt like Braxton was ready for something more, but with so many apps on the market I had no idea where to begin. By this time, I was following the blog of another mom with an Undiagnosed child also navigating the AAC waters. I admired her writing and her advocacy and loved how much she believed in her daughter and fought the system when necessary. Dana Nieder introduced me to Speak for Yourself. I had seen videos of her daughter, Maya, using the app and read posts about the success she was having and I remember repeatedly thinking, “Man, I wish Braxton could do that.” She wrote a post about why she felt Speak for Yourself was the best Communication App on the market. I was sold. But, 1. the app cost $200 2. We kept hearing that Braxton ‘wasn’t ready.’ 3. I truly believed he wasn’t ready because his fine motor skills were just too poor. I continued to follow their journey, but was reluctant to take that jump. The app went on sale for 50% off for Undiagnosed Children’s Day and I just knew we had to have it. I convinced Joseph (and myself) that this is what we needed for Braxton and we purchased it in April of 2014. I played with the app and even joined the Facebook user group to talk to other parents using the app. But, I admit I had no idea where to start and was just overwhelmed. Our speech therapist wasn’t totally on board with this particular app just yet. She was definitely on board with AAC, but she wasn’t familiar with SFY and even though she knew of many other apps, she wasn’t quite sure which was the best fit for Braxton. So, I began the navigation on my own. I introduced the app to Braxton with only a few words open on the screen and focused on things like “more,” “eat,” and “want.” Again, best practice says to start with the highly motivating activities. So, we used it during meal times. Braxton was not interested in telling me he wanted more food, he simply opened his mouth and moved toward the spoon. I felt defeated. We used the app off and on on our own, but without guidance it kind of fell by the wayside. When we met with our school district for Braxton’s initial evaluation in May, I showed the evaluators how we were using Sounding Board and had introduced Speak for Yourself. They supported the idea that Braxton was not ready for SFY and even told me the app was no longer available. Regrettably, I allowed that to be the nail in the coffin. When Braxton started school, we were told he would be evaluated to see what AAC system would be a good fit for him. I was hopeful that we would find an app on the iPad that we could use at home and practice with him. When we met with the evaluators, they expressed some of the same concerns we had already faced: his fine motor ability made it really difficult for him to be successful with an iPad app because of the small size of the icons. They were also concerned that the volume of the apps were too low for him to be heard in a noisy classroom. They recommended starting with a Springboard. I was excited to have them on board our AAC journey, but disappointed that this is what they recommended. I decided to give it an actual shot and we were allowed to take the device home each day and practice. I was surprised to see that Braxton was in fact interested and showed promise. After trying the device for a few weeks, I couldn’t shake the feeling that this was inadequate. I felt like the device was heavy and not enough for him. I just knew that he was capable of more. The school therapist herself told us that the device was programmed with up to a 5 year old vocabulary. The icons were a bit larger than the SFY app and the school also provided a key guard which helped with Braxton’s accuracy. Ultimately, I decided that I really wanted to make SFY work for us. I visited Dana’s blog again and this post made me realize that if this is what we wanted, we had to do this on our own. I spoke to our private speech therapist a little bit more and she was on board with helping us learn to use SFY. We tried it on our own for a few weeks before I went in and spoke with the school therapist and technology professional to express my concerns. 1. I was worried that this system would not be able to grow with him. If it only had up to a 5 year old vocabulary, Braxton would only be able to use it a couple of years. I knew that cognitively he might not reach a 5 year old level for a while, but to me, that didn’t mean that I should hold him back. I still wanted him to have access to the vocabulary his peers would have regardless of where he was cognitively. 2. If he only used this for a couple years, that meant he would have to change and learn a whole new system with a bigger vocabulary. I felt like we would waste time having to learn a new system. That it would set back any progress we made. At the end of the meeting, we decided that we would try Speak For Yourself (October 2014). We would send our iPad mini to school each day and they would use that for communication purposes. Our private speech therapist was on board and excited to help us navigate the AAC waters. One of the “roadblocks” we faced was the evaluators telling us that Braxton wasn’t ready because he lacked the accuracy to target the very small icons. I remembered a genius idea I saw on Dana’s blog (are you noticing a trend here? Please see Dana’s blog for some truly excellent advice on AAC) about her using a glove to help her daughter with targeting and accuracy. We used it for Braxton and it worked like a charm! You take any old glove and cut off the index finger of the glove. An iPad only works when it is touched by your warm finger. If anything is blocking it (like a glove) it won’t work. The idea was that Braxton would learn that the device would only talk when he used his pointer finger. This also helped when he couldn’t tuck his fingers in so that he wasn’t accidentally hitting other buttons. To my surprise (and delight) he caught on very quickly. We also used the glove when Braxton was using other apps to really get him to understand how to use his pointer finger. Here is Braxton with the glove telling me that he wants more food. Within a few weeks of using the glove, Braxton didn’t need it anymore. I used my hand to prompt him to remind him to tuck his fingers and guided his hand from his wrist. I began to realize that Braxton was learning to press the buttons on his own and even moving his hand to what he wanted to say. One of the major tenets of the app is motor planning. Motor planning is something we all use daily, disabled or not. Can you type without looking down at the keyboard? Can you deal cards for a poker game? Do you have a certain place in the kitchen for plates, utensils, dishes? Ever wonder how you did something or got somewhere without ever realizing it? That’s all motor planning. Once we learn a routine, we are able to do it without even thinking about it. This is very important to AAC users and an important piece to being able to use an app like this. The user depends on the location of the icon more than the category or any other organizational piece. Braxton began learning that to say “eat” he had to double tap. He began moving his hand from one area of the screen to the next word all on his own. The app allows you to “hide” certain buttons and only leave “open” a few or many. We started slow with some key words open that would still allow Braxton to make complete requests. “Want eat,” “want read,” “more food,” etc. Starting with a few words made it all a little less overwhelming for me and for Braxton. We opened words that had to do with what he was learning in school so he could participate with his classmates. We also opened other words as we realized they were needed. We made slow progress throughout the school year, but we made progress. In January of 2015, I feel like everything started to come together. Braxton got a trampoline for Christmas. He loved it. He became obsessed with it. I opened the word on the talker and showed it to him. He began requesting the trampoline! He was doing really well using the app to tell me he wanted more food and I would give him another bite. One day during his meal he found the trampoline button. I promised it to him after we were done eating. As soon as we were done, he asked for the trampoline again and we took him over to it and at that moment I truly think he realized the power he had to tell us what he wanted. We continued using his talker during very specific activities. Braxton learned how to ask for different toys and when he was done with a toy, he reached out for the talker to choose a different one. It was clear to us that he knew and understood the purpose. By the end of the school year, I met with the speech therapist and the technology professional during Braxton’s final ARD. They recommended that we continue using Speak For Yourself, but move up to a full size iPad instead of the iPad mini. They allowed us to take it home over the summer, and boy, have we made some progress!! We are using the talker more and more throughout the day and I always make sure it is accessible even when not in use. It might be sitting on the coffee table in the living room or the couch. When Braxton needs it or just wants to explore he finds it. Here he is on May 29th (just before school ended and only one week with the full size iPad vs. the mini) – Braxton was all about hugs and kisses during our speech session, so we decided to make him ask for them! He caught on immediately! I guided his hand, but slowly removed my support and you can see that he very purposefully sought out the buttons and asked for hugs and kisses. One month later, Braxton is still all about the hugs and kisses, but he is also using the app more and more. I leave his iPad out for him and he can walk up to it while it is off, turn it on and start talking to me. He will request toys, but mostly he asks for hugs and kisses. Most importantly, he is doing it all by himself! I don’t even have to guide him as much! In this video, you can see him again requesting hugs and kisses, but he is navigating all on his own and even when he hits the wrong word, he keeps going until he finds the word he was looking for. (We have ordered a key guard that will help prevent mis-hits and give Braxton greater accuracy). And just look how happy he is to be able to communicate! He is telling me what he wants and he is understood! So amazing!! Speak for Yourself also has a “Babble” feature. If you only have 10 words open, you can select “Babble” and it immediately opens ALL of the possible vocabulary. A user can then explore different words and “babble” much like a typically developing baby or toddler would. (Think of baby talk, ma ma, da da, ga ga, goo goo – babbling these sounds is how babies learn to talk. We hear “ma ma” and immediately respond “Oh, you want mama? I’m right here!” That’s how babies learn that the sound ma ma means I want my mom.) AAC users using the SFY app can have that same experience. Braxton will tap different buttons and depending on my response he will find that button again. Sometimes he just stims on the words and his intent is not to communicate, but just to listen to the words and explore. Much like a baby would when they are cooing and babbling just to hear their voice. Lately, the babble feature has been a favorite of Braxton’s. I’ve caught him multiple times, “babbling” himself to sleep. We are still just at the beginning of this journey, but I am so very excited to see all of the progress we are making. One of the many myths about AAC is the idea that using a device will impede an individuals ability and will to learn to speak verbally, but that couldn’t be further from the truth. The device is just one more language model and actually helps individuals learn verbal language. In fact, we have heard Braxton using his voice to actually babble a little bit more every day (except during speech therapy, of course!) and it’s so wonderful to hear new sounds. I have felt like we were on the verge of a verbal breakthrough for quite some time, and I feel that more than ever now. I am so glad that we took the plunge and decided to start using Speak for Yourself. Braxton is now able to interact with the world around him in a whole new way. He is learning more each and every day and continues to make progress. I am so excited for him to return to school with his new skills. There is no way anyone can tell us now that this is not a good fit for Braxton. Braxton WANTS to talk, he WANTS to communicate with us. The words are there, he just can’t get them out…yet. Speak for Yourself is now giving him a way to get the words out! He is able to communicate and tell us what he wants. The sheer pride on his face when he hears what he wants is priceless. He has finally found his voice! I can’t wait to hear all of the things that have been going on in that sweet little head of his. It’s never too early to introduce AAC. No child is “too delayed,” “too young,” “too complex,” “too anything!” to learn an AAC system. My speech therapist repeatedly tells me stories of a patient she has who is completely BLIND who uses an iPad and an app to communicate. Motor planning is an amazing tool! Research, ask questions, join the user groups – Jump in to discussions and ask questions. That’s how you learn! Don’t let anyone discourage you!! PRESUME COMPETENCE – Instead of assuming your child can’t do it, give them the benefit of the doubt. Believe in them! They just might surprise you. Try different programs! Again, there is no one-size-fits-all solution. What works for me, might not work for you, and that’s okay! Many programs offer a “lite” version or a trial period that allows you to try the app before you introduce it to your child. Practice!!! We had the app for 6 months before we really started using it. Dive in and practice, practice, practice. You can’t teach the app if you don’t know it yourself! Don’t be afraid to explore. BACK UP YOUR VOCABULARY! Many apps give you the option of saving your vocabulary (much like you back up your computer to a hard drive) which is a life saver when the inevitable happens. I’ve read lots of stories of iOS updates gone wrong, kids accidentally deleting the app, devices being lost or dropped in water – any number of things can happen. If you have a backup, you can easily restore your vocabulary and set up should anything happen to your program or device. – Uncommon Sense Blog – I mentioned Dana Neider several times throughout this post. She is a mother of a child with complex communication needs and also studying to become a Speech Pathologist. Her blog chronicles their journey with Augmentative Communication and she has some really excellent posts about their journey, resources, tips for advocating for your child, and how to get started with AAC. I highly, highly, recommend parents exploring AAC go and visit her blog. – Speak for Yourself – SFY was developed by two speech pathologists and their website is extremely informative. Their Facebook page and the Facebook user groups are very active and the app creators are very accessible and even respond to questions. I think that is one thing that I love most about this app. The creators are extremely active in the user community and even take user feedback constantly to improve the app. – PrAACtical AAC – This Facebook page offers some general information about Augmentative Communication that can be implemented regardless of what communication program or device you are using. They put out some really great resources and are also a very active page. – There are SO, SO many resources out there and no list that I could put together would do this field justice. Search Facebook and twitter hashtags to find other users and resources. Visit family blogs (like this one) to learn what others are doing and the programs they are using. If anyone has any resources you’ve found particularly helpful, please feel free to link them below!